Raven Supply Takes on Chicago | Raven Hydronic Supply Ltd.
Our team in front of the Weishaupt facility. Recently, the Raven Supply team went to Chicago to learn more about the latest advances in burner technology. Our trip to the Windy City gave us a chance to do some hands on training at the SSC Combustion for Siemens Controls and Weishaupt USA facilities. 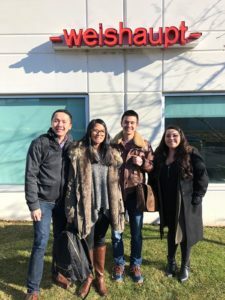 The four of us- Bennett Lee, Nc Sun, Merinda Widmer, and Linna Luu- spent time at each facility, touring and learning all we could about various new models on the market. “We even got the opportunity to ‘service’ the burner where we swung open the burner head hinge. It was very enlightening to see the ease of service and now I understand why service technicians love this aspect of the Weishaupt design,” he adds. Merinda also appreciated the up close and personal experience that comes with visiting a facility in person. 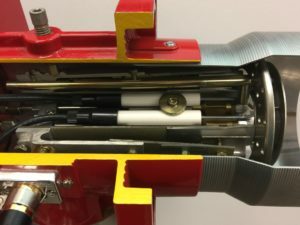 Cutaway of ignition electrode assembly at Weishaupt USA. Nic was struck by the accuracy and ease of the newest burner technology to hit the marketplace. “Siemens’ stepper motor actuators have redundant position feedback sensors, accurate to 0.1 degrees of rotation. Because there are 2 sensors, the actuators never require recalibration,” he enthuses. In addition to our training, we spent some time enjoying the sights of Chicago, and even put in some time trying our luck at the lanes at the famous Pinstripes bowling alley. Here at Raven Supply, we’re always doing our best to stay up to date on the latest and greatest in burner technology, so that we can bring you the best service possible. Stay tuned for more news on our next adventure!